But this is nothing new for the Sprouts program, which has embraced this vision since its inception nearly 30 years ago. 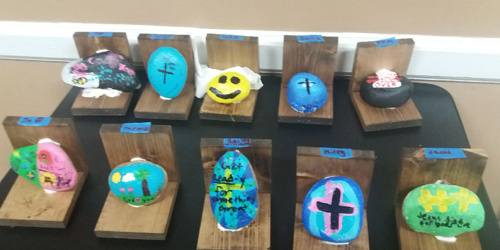 Created by BSUMC Children’s Minister Reverend Gayle Quay, Sprouts is a covenant group for children in grades four and five. Rev. Quay uses the Jerusalem Cross to give the children a visual representation of acts of discipleship: Acts of Compassion, Acts of Justice, Acts of Worship, and Acts of Devotion. The children are encouraged to engage in these acts weekly and to tell about their efforts at their Sprouts meetings. However, the Sprouts program offers so much more than a weekly meeting. 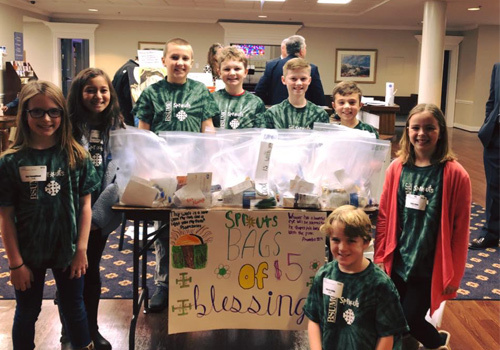 Buncombe Street’s Sprouts, in their signature green t-shirts, are a well-known and welcome sight at the non-profit agencies dedicated to helping the “least of these” in the Greenville community. These include United Ministries, Ronald McDonald House, Shepherd’s Gate, the Salvation Army, Serenity Place, Emmanuel’s Hammer, and others. One of the first lessons for many of the Sprouts is that poverty is not limited to distant continents but is found, in fact, right outside the doors of Buncombe Street. “At first, our kids can’t believe that within a mile of here, we have people living in conditions of deep poverty,” Rev. Quay said. 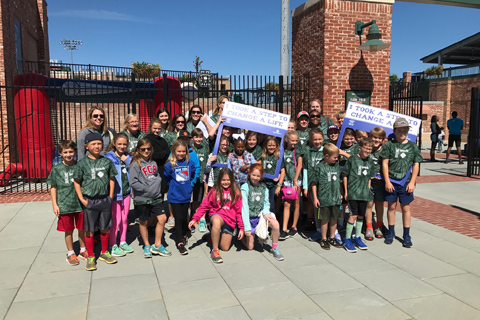 Each year, the Sprouts participate in the United Ministries Transformation Walk, which begins at Fluor Field and takes participants along the three-mile route that many people take when seeking assistance from valuable service agencies in downtown Greenville. The Walk also takes the children through some neighborhoods that emphasize the desperate need for safe, affordable housing in our community. The Sprouts are exposed to the homeless community through their visits to the Salvation Army, the Triune Mercy Center, and through an annual Poverty Tour. The fourth-grade Sprouts take a driving tour, while the fifth-grade Sprouts are led on a walking tour conducted by Buncombe Street staff member Bobby Thompson, who has experienced homelessness firsthand. Mr. Thompson said he now feels called both to minister to the homeless in our community and to help the Sprouts learn to do so as well. One of Rev. Quay’s most poignant memories is of a time the Sprouts were visiting the families at the Interfaith Hospitality Network (formerly GAIHN), which is a network of churches offering shelter and support to homeless families with children. “The kids always think that they could never know any of the homeless children, but that time one of our Sprouts saw one of his friends in GAIHN. It was a shock for him, and it was awkward for all the kids at first, but they got past it and were able to have fun together. I know, though, that having that experience absolutely changed that Sprout’s life. He’ll never forget it,” Rev. Quay said. Of course, dealing with such painful realities can be difficult for anyone, even adults, so great care is taken to make sure that the young Sprouts aren’t overwhelmed by the new experiences the program offers. 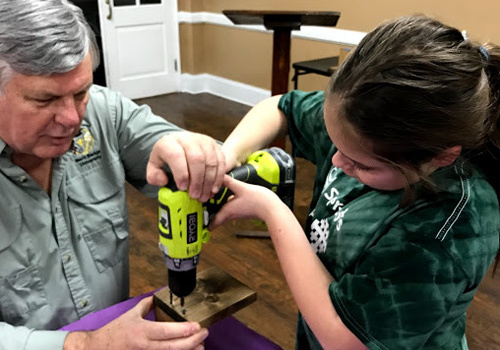 This idea that small hands can be useful and productive is at the heart of the Sprouts program, which strives to teach children that part of being a disciple of Christ means loving and helping others. Bailey and her fellow Sprouts visited an Emmanuel’s Hammer project site – Operation Laura (Learn more about this project on the Emanuel’s Hammer website). Laura Dobbins’s house is complete now, but hidden beneath the drywall are notes, blessings, and Bible verses written by the Sprouts on the 2×4 studs. They so enjoyed seeing the project and meeting Laura that they later planned a housewarming party for her. Sometimes these acts take the form of a new pair of socks on a cold night. Sometimes they’re scribbled on 2×4’s or whispered over a blanket. Sometimes they’re heaped in a laundry basket. And sometimes they’re visits to people who are struggling… people whom no one else thinks to visit. That’s what it means to have the heart of a Sprout.